It’s another recipe from The Cousin! You remember her, right? The Cousin of Salsa Roja fame? Yeah, that girl. So you know it’ll be good. Let’s get to it! Before you do anything, get a bunch of corn husks soaking in water. After they’re finished cooking, discard husks and serve with your tamale sauce. SO YUMMY, and great comfort food for the cold weather upon us. Enjoy! Oh, this is great!! I’ve been wanting to make tamales on my own (singular for “tamales” is “tamal”, not “tamale”) since…forever, but I don’t have a vegetable steamer. I was just asking my mom to get me one today, and she forgot to get it. Then I see this post just to tease me more haha. Your tamales look fantastic. I LOVE tamales. These look great! Yeah it would be “tamal sauce”. I just made tamales too! My mom bought me a steamer for Christmas. I am from south Texas and I was wondering what you use for the filling in your tamales. 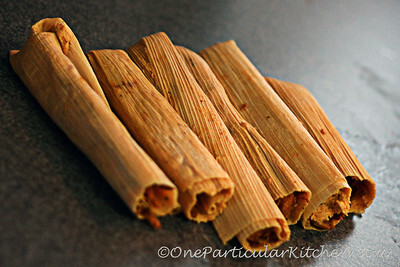 My family loves tamales and your recipe sounds a lot simpler than mine since I spend about 2 days making them. About how many tamales does this recipe make? Hi Melissa: we slow-roasted and shredded some pork for the filling on these, I believe, and added in some of the sauce before using it for filling. I want to say these made a couple dozen? I’ll see if The Cousin can chime in and let us know for sure.